Expanding Air China's reach into North America! 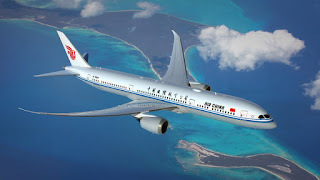 Air China is expanding its reach into the North American region by adding to the three daily Los Angeles-Beijing flights they operate with a new route that connects Southern California's Silicon campus to China's own Silicon Valley starting 7th December 2017. The three times weekly nonstop service between Los Angeles and Shenzhen will be operated by the airline's newest Boeing 787-9. It will be the first direct service from Los Angeles to China's City of the Future. "With China as Los Angeles' top trading partner, we are committed to growing and strengthening the economic and cultural ties between the two. The new nonstop Los Angeles-Shenzhen service brings together two of the world's leading technology and innovation hubs," Dr. Zhihang Chi, Air China's Vice President and General Manager stated. According to the Los Angeles County Economic Development Corporation (LAEDC), the majority of Chinese investment into the United States originates from Guangdong Province which covers Shenzhen and Guangzhou. Dr. Chi added, "At no time is the connectivity between these two cities more needed than it is now when China's homegrown tech companies with headquarters in Shenzhen are expanding their presence and direct investments in the United States. This new service offers more options for business and leisure travellers to Shenzhen and Hong Kong which is only 19 miles away. "As this will be operated with our newest Dreamliner which includes a premium economy class cabin, we are confident our competitive fares and affordable, easy upgrade programs will be very attractive for travellers to Shenzhen, Hong Kong and beyond. In addition to extra legroom, our premium economy passengers also enjoy priority boarding and more Phoenix miles, among other amenities." Air China's B787-9 three-cabin Dreamliner features 30 seats in Capital Pavilion (business class), 34 premium economy and 229 economy class seats for a total of 293. Note: * All times are local. ** +2 = Two days. Days of operation and times are subject to seasonal changes. This latest announcement from Air China is just part of the carriers unprecedented expansions into North America and brings the average of its seasonally adjusted flights to 150 per week between cities throughout the region and China. Since 2013, China's national carrier has been launching a new route every year. In September 2016, Air China launched its nonstop service between Shanghai (PVG) and San Jose (SJC), its first direct service between Shanghai and North America. The international carrier's other U.S. and Canada gateways offer nonstop services to Beijing from Los Angeles, San Francisco, New York, Newark, Washington Dulles, Houston, Honolulu, Vancouver and Montreal.